Yin is slow and passive. It is steady and reflective. It is the energy with which we approach our Yin Yoga practice. Our aim is to target the deeper connective tissues within the body. We do this through longer and stiller holds that that of Hatha Yoga. We modify asanas due to the bio-individuality of each practitioner and target different parts of the physical and energetic body. The body and mind are challenged in a multitude of ways helping us to not only reap the physiological and anatomical benefits but also to cultivate more mindfulness and mental health benefits both on and off the mat. 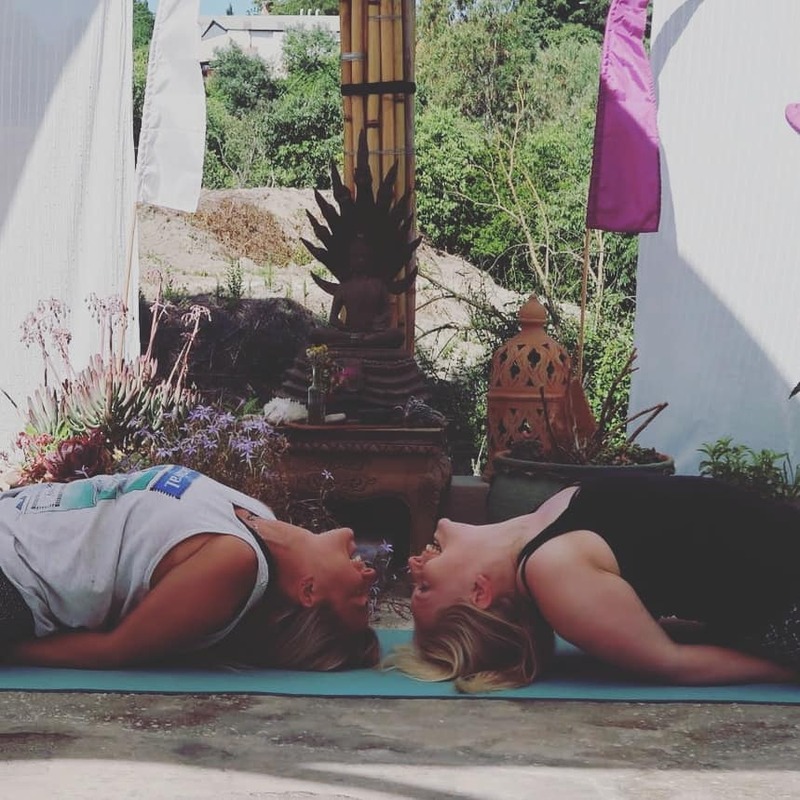 By joining this course and studying Yin Yoga professionally, you will gain the knowledge and experience to confidently share your understanding with your students and others while also deepening your own personal practice. This allows you the opportunity to hone your existing skills and expertise, to a new profound depth, while learning new and informed ways of cultivating a powerful and safe class for the general public. Functional Anatomy; understanding unique individuality of human beings and translating this into not only yin yoga but our day-to-day practices. You will be introduced to functional anatomy, the fascial system, muscle groups and target areas, asana (posture) breakdowns and the art of propping. Art of propping is taught in a unique way but can be adapted to all other styles of yoga asana. Teaching Responsibly; teaching from the heart while understanding the great responsibility you hold. You will gain practical experience in holding space for others mentally, emotionally and energetically but also keeping yourself and the student’s safe while practicing yin yoga. We will explore things like communication, propping, sequencing and other components that make a strong teacher. You will be able to confidently sequence and guide a safe and accessible class while understanding the power of the language we, as teachers, use as well as offering ways in which your students can further explore the capacity of their thoughts, beliefs and patterns. Chinese Medicine and 5 Elements; in this part of the training you will break down the essence of the energetic body and how we can teach yin yoga form this approach. Breaking down Chinese Medicine theory, Yin Yang Theory and the 5 Chinese Elements you will gain new insight as to how we can benefit from yoga, how qi flows around the body, emotions that are relevant to the elements and how we can translate this into the 5 bodies approach for a holistic practice of teaching and moving meditation / asana. Furthermore, you will layer onto the depth of your philosophical education by looking at the Yin Yoga from its original roots; the taoist point of view. Self Love and Compassion; When teaching such a deep and sensitive practice that encapsulates the 5 bodies it is important to offer a compassionate undertone of every experience. Yin Yoga is a style that allows more space than other practices for samskaras to come up to the surface, through emotions and emotional release. This means that the scope of a yin yoga teacher should be able to approach this in a compassionate and self loving way. Revisit the beginning of your yoga journey and take the next steps in your career by returning to the roots of the ‘why’ and ‘how’ we approach the components of teaching yoga. This course and its components will guide you through your strengths and areas of development with active workshops, practical learning, theory classes, group work, individual reflection, self-practice, case studies and practicums. This course works towards the development and goals in creating the right avenue for you in Yoga. Re-align the ‘why’ and the ‘how’ in your yoga teaching by enriching your knowledge base, skills, and experiential learning by intricately picking apart the core foundations of each body approach, intricately weaving teaching methodology and asana practice throughout the whole course. The practical workshops and interactive sessions provide you with a wide variety of learning approaches and a solid ground of teaching techniques. 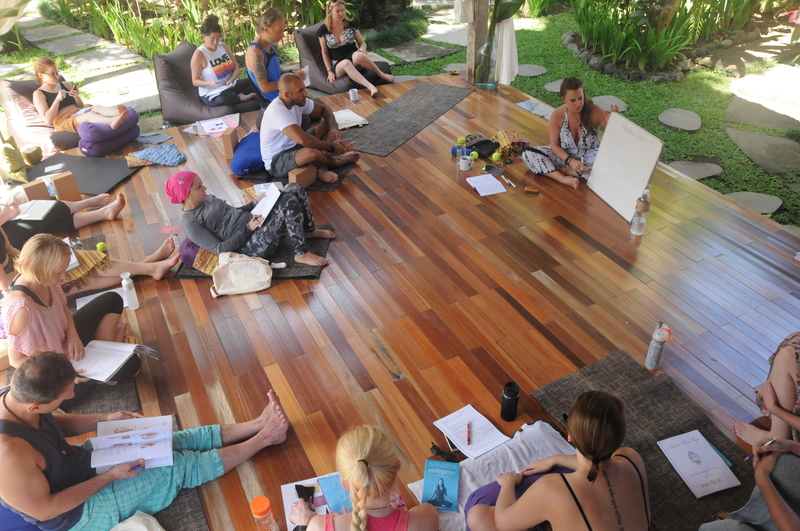 The theoretical classes provide you with an opportunity to take a deeper look and specifically evaluate, question, discuss and develop the topics which make up the backbone of teaching, exploring and developing your experience and expertise in yoga. The goal of this course is designed to expose the natural ability and potential of the student to teach with confidence and a high level of teaching expertise, with a solid understanding of how to elevate your yoga teaching career to enable yoga teachers to share their passion with authenticity and confidence. Whether you are a frequent yoga teacher in yin or yang styles this course will benefit you. If you have completed a basic 200 hour course already then this course is also for you. What is shared, explored and unveiled in this teacher training course is not covered on a basic 200 hour course. While this course will be accredited for 200 hours of teacher training, it is in no way a ‘basic’ training. 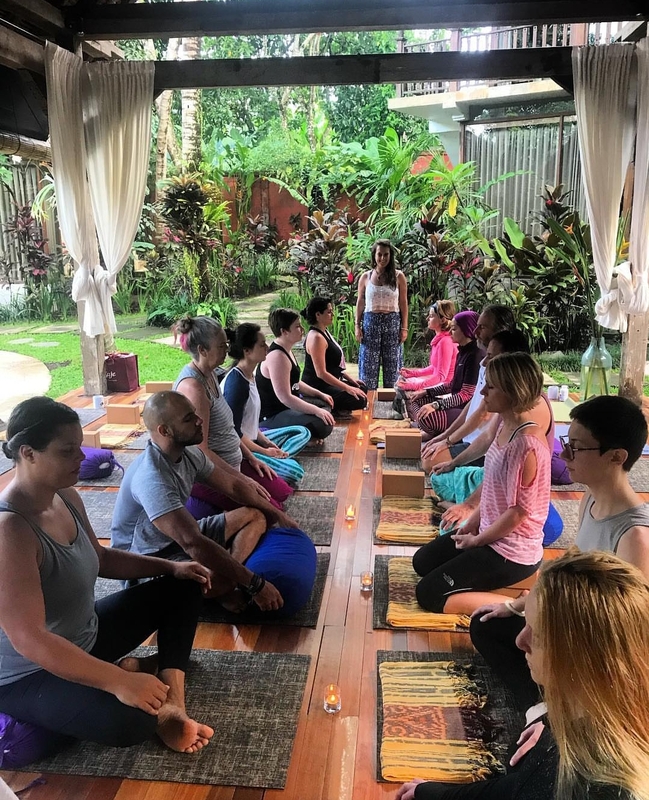 With small groups there is a lot of one on one time with the teachers, as well as individualised time to help you expand on what you already know, practice and experience. With the magical vibration of Bali, among the trees, this retreat oasis is a haven for reflective practices. The ambiance is one of love, light and connection, to mother earth and to the self. 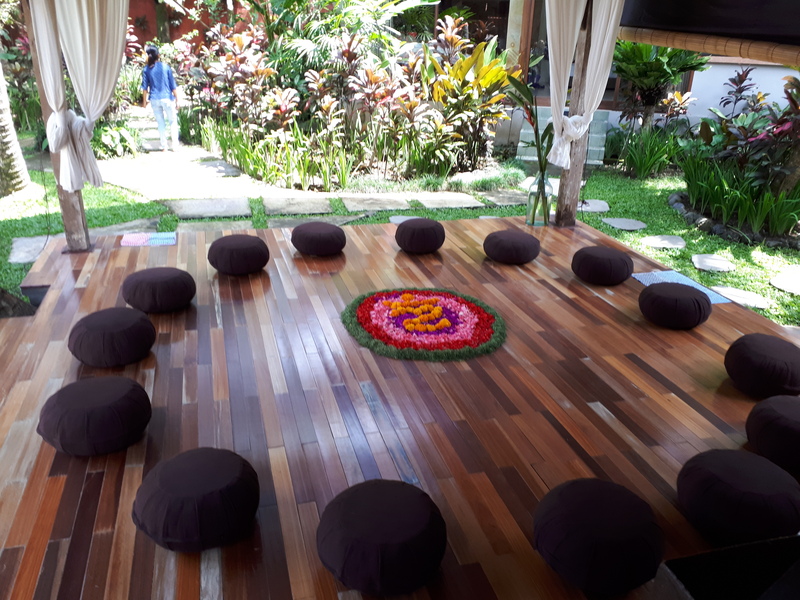 The tropical atmosphere gives an exciting and adventurous feel while the grounding practice of yin and yoga keeps you centred, calm and relaxed. The Mindfulness section, neuroplasticity and the trauma-sensitive parts were eye-opening and enlightening. These sections apply to way more than only yoga. The structure of the course is very well organized, makes sense and flows perfectly. LOVED how Amanda described and conveyed the message/points. She articulates it well, makes sense, enjoyable and easily accessible to anyone. Amanda has such a profound depth of knowledge and wisdom.. It is presented in a sincere, genuine and professional way which leaves you feeling empowered. It is the best course I have undertaken and I highly recommend it as it is a beautiful journey. This will be a message I carry through my teaching and life. It’s hard to put on one finger what I loved most about this training but one thing that will stay with me throughout my journey is the empowerment, sense of ownership and knowledge of self that Amanda embodies and encourages for her students.